When we finished the ride on August 23 we had a mixture of cash and pledges for 31-32 wells. In the back of our minds we wondered, “Will all the pledges come in?” The good news is we have seen more than what was pledged come in so that puts the total amount received to date at $276,005! That is an incredible 32 villages with 32,000 people with clean water! Sixteen wells have already been provided by GAiN. Ten wells have been drilled in Benin and six in Togo. I hope you are encouraged by what has taken place so far, and we will be happy to update you once all the wells are provided to the villages. 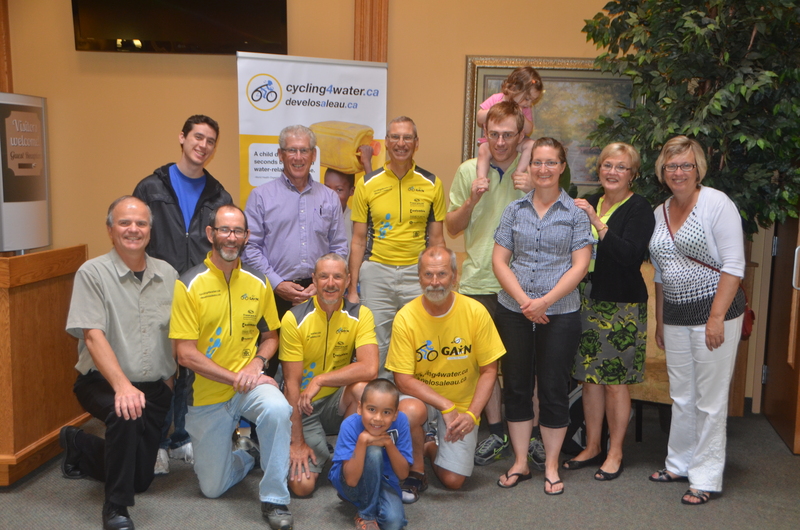 Once again, on behalf of the Cycling 4 Water team, thank you for your partnership! Your help and encouragement along the way was so significant to the overall success of this project. Together we are seeing lives changed and villages transformed for years to come! Jacquie and Richard have adopted a baby! However, this baby was adopted as an embryo, so Jacquie is now 4 months pregnant, and the baby is due in July. They are very excited! Rob finished the fall cycling season strong, mostly recovered from his dramatic fall outside Winnipeg. He, in fact, would like to cover the distance he missed because of the accident this coming summer. He’s looking for a support vehicle driver. Timo is discovering what retirement is really like. He has almost finished a complete reno of their basement. We all know the dangers of reno projects. They seem to spread! Many people ask if we are doing any cycling. With the exception of Rob, cycling has taken a back burner this fall. We all plan to get “back in the saddle” this spring. In just a few weeks, Global Aid Network, through it’s Water for Life Initiative, will be celebrating the significant milestone of providing 1,000 deep-capped water wells in Africa, resulting in 1,000,000 people with access to clean water.